The Altice One remote features voice commands, and sleek backlit keys to help you navigate to your favorite shows and movies easier in the dark. Pairing the remote to your Altice One allows you to use voice commands and gives you the ability to control the box even when it is placed out of sight, up to 30 feet away, such as in an entertainment center. Press the HOME or A button on your remote. Select the remote icon at the bottom of the screen. Select PAIR REMOTE TO ALTICE ONE. You'll see on-screen confirmation that the remote is paired. Important: Once paired, the remote will work only with the paired Altice One or Altice One Mini. If you have multiple boxes, a remote paired to the first box cannot be used to control a second box. Click here to view the tutorial on how to Program Your Altice One Remote. 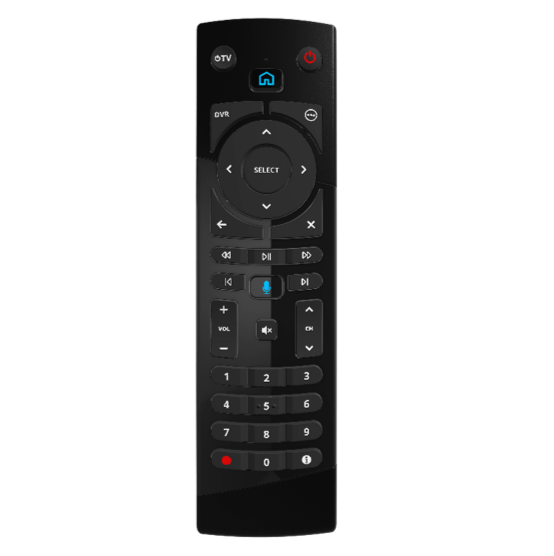 You can program your Altice One remote to conveniently control your TV's volume and power functions. Identify your TV brand from the list below. If your brand is not on the list, please see below for the Auto-Search or Four-Digit Code Programming Method. Press and hold the TV POWER and the brand number of your TV for 3 seconds, until the light at the top of the remote turns blue, then release the buttons. With the blue light on, press and hold the TV POWER button until the TV turns off. Press SELECT to store the code. The status light will turn off. Verify by pressing the TV POWER button. This should turn the TV on and off. Important: If your remote does not control the volume or mute function after following the steps above, try the Auto-Search Programming method below. Press and hold the TV POWER and VOL+ buttons for 3 seconds, then when the status light turns on, release the buttons. Press and release the 1 button. Press and hold the TV POWER button until the TV turns off. Press SELECT to store the code when the TV turns off. Status light will turn off. Important: If your remote does not control the volume or mute function after following the steps above, try the Four-Digit Code Programming method below. Press the TV POWER and SELECT buttons on your remote for 3 seconds, then release. The status light will turn on. Enter the first 4-digit code corresponding to the TV brand. The status light will turn off. Press the TV POWER button to test the code. If the TV doesn’t turn off, repeat steps 3-5 with the next code on the list until the correct one is entered. Note: If there is more than one four-digit number listed for the TV brand, try one code number at a time until the TV turns off. Press and hold the TV POWER and SELECT buttons until the HOME or A button blinks twice. Point the remote at the box and press the VOL- button. Note: To go back to controlling the TV's volume, repeat the steps above. When you want to use the paired remote with another box, you need to first unpair it from the current Altice One box or Altice One Mini. To unpair or clear the remote. Press the 7 + 9 buttons together and hold. The status light will blink and then turn off when it is unpaired. With an unpaired remote you will not be able to control the box when it's out of sight or use voice commands.